*Featured in The Carnival of Personal Finance #233 hosted by @RevancheGS on A Gai Shan Life. Debt-to-Income-Ratio is the amount you owe measured against your income. Motley Fool’s Get Out of Debt worksheet is what started my family’s debt free journey and blogging about our personal finances. In the beginning, the family’s bad debt-to-income-ratio was approximately 112% paying $3496.27 annually in interest! The first part of the worksheet is figuring out the interest you pay on the debt owed. Watch out, this part may sting a bit. 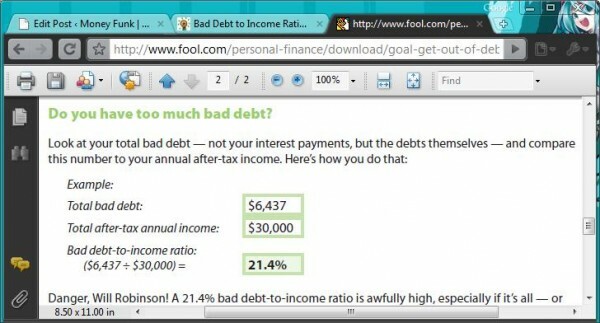 Next, the worksheet requests you to figure your bad debt-to-income ratio. The difference between Motley Fool’s recommended calculations and others – the Fool’s worksheet has you calculate the bad debt to your net income. Most calculations request that you use your gross income. Why the difference? Because the fool wants to entice you to jump start your debt free journey (let me tell you 112% gets you moving like a jolt of electricity). Try the worksheet for yourself. Understand, where your financial nature stands. It’s amazing how energetic you’ll become in wanting to pay down your debt when you discover just how much interest you are paying annually. Where does my family’s bad debt-to-income-ratio stand now? 93%. I had problems posting a workable Excel sheet on this screen, click here to be directed to a full version. Enter the requested information – APR & Balance of card or loan – and the Annual Interest Paid will automatically be calculated for you. 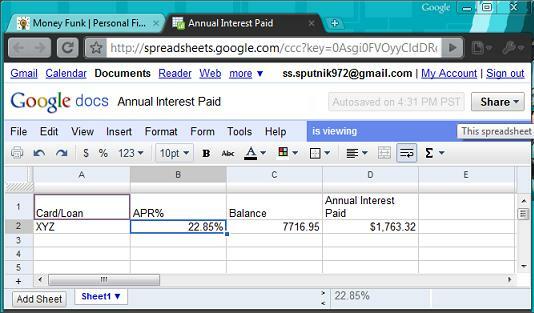 This entry was posted in Finances and tagged Bad-Debt-to-Income Ratio, debt to income ratio on 2009-11-27 by Christine. wow – why do I not even want to figure that out right now… the thought makes me sick!!!! ignorance is bliss, but I guess that is what got us so far in debt huh? LOL. True – ignorance is bliss but only for so long. I am really happy to know that I am fighting to get out of this mess with my chin up! Although, at times it can be tough, I doubt that I can succeed, and keep asking self doubting questions – if I just keep persisting one penny at a time (hopefully more) that I will make it to a debt free life. I know you are going to make it to. No doubts in my mind!